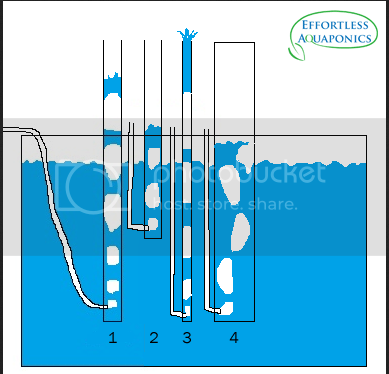 So, I have decided to do away with dirt garden and go to an Aquaponics system. Wife said she was tired of using the amount of water it takes to grow anything in our soil (that is after amending with peat/new vegetable soil/other ingredients/etc). 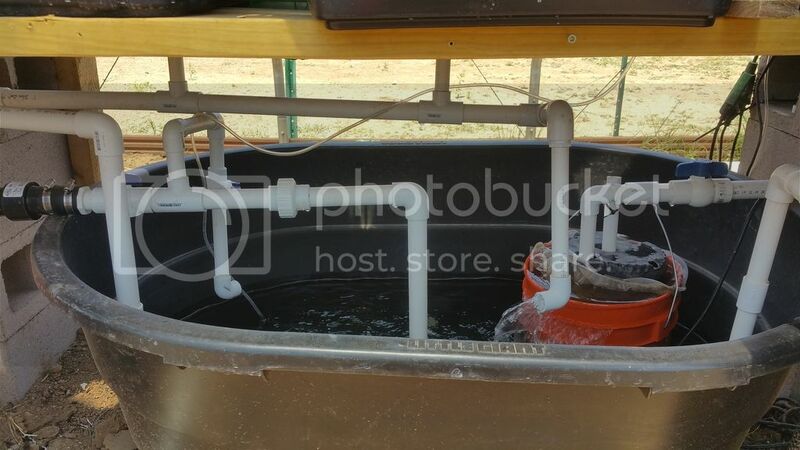 CHIFT PIST system with x2 100 gallon stock tanks , swirl filter, into x6 media grow beds (27 gallons each) filled with pea gravel. One (x1) channel cat, x8 minnows that started the system cycling (around the beginning of May and added x13 Koi around the first of June. 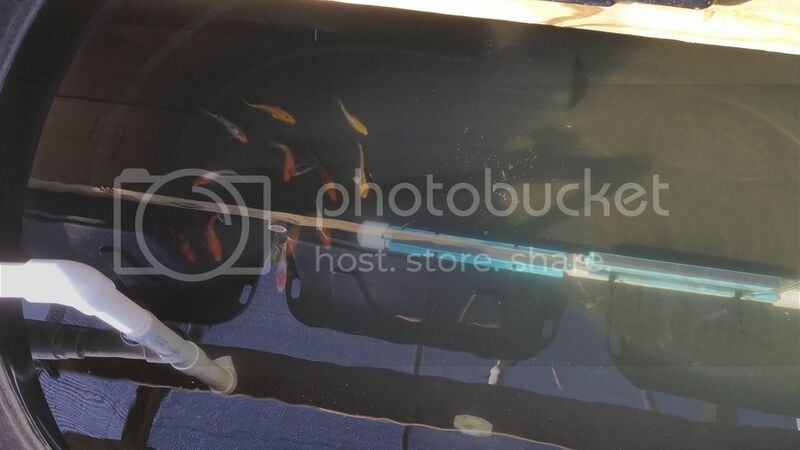 path of travel -- sump tank => swirl filter (have a 1" drain at the bottom with a 5 gallon bucket (upside down to slow feed from sump) => 1 1/2 (40mm) gravity fed to the GB/FT => 1" (25mm) SLO back to the sump into a 5 gallon bucket with a liner to act as a preliminary swirl filter. (Already looking at changing SLO to 1 1/2 (40mm) when I go to town and have a place to get fittings). 1000w heater in the fish tank and an air pump running x2 10" air stones attached to the SLO in the FT with an additional 4" round air stone in the sump. I have been lurking in the shadows since I started this back in May, and now I need to come out and seek advice for this grasshopper to pick up some sound advice as to how to go about achieving the best end result. The Koi was my wife's fish of choice, but I plan on doing something that will be able to find itself onto the dinner table. 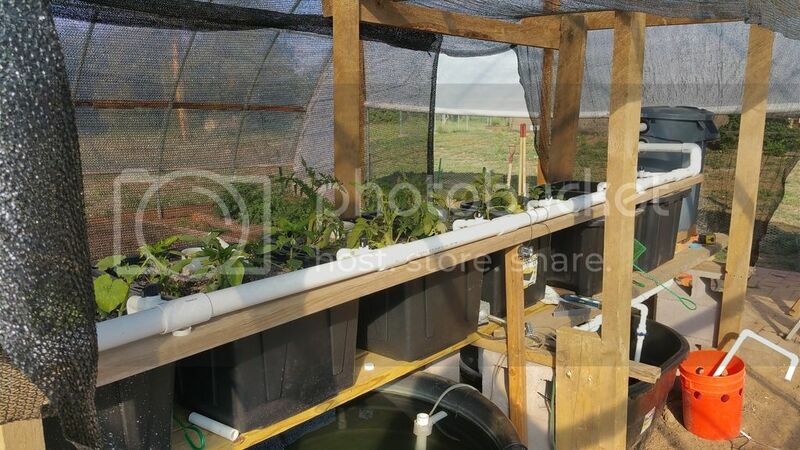 The High Tunnel is a 30x36x12(h) and have the materials to put second layer of film with air gap between layers. Temperature control air movement to maintain temperature inside the green house and removing the roll up doors and closing in the ends with some double walled polycarbonate. Would like to make the system as minimally dependent upon A/C power for it is always a crapshoot if we are going to have continuous power. Not so much in the spring/summer as it is in the fall/winter. There are roughly 150 people in my community, and we are not always the first to get back up when there is an outage. I'll probably need to look at putting some sort of pot belly stove in the Greenhouse to supplement heat on the cold nights, but in the past, when the snow is on the ground and it seals up all the air gaps, it stays pretty warm (just below freezing) even with all the other air gaps letting things come in/out. I have seen soo many different systems, and kind of have an idea, but due to timing/funding, I would like to try and save some of the 40% extra learning curve/funds from trial and error on my own as I go back and re-read a bunch of the existing members systems to have a better understanding now that I have something to base it on with my current system. 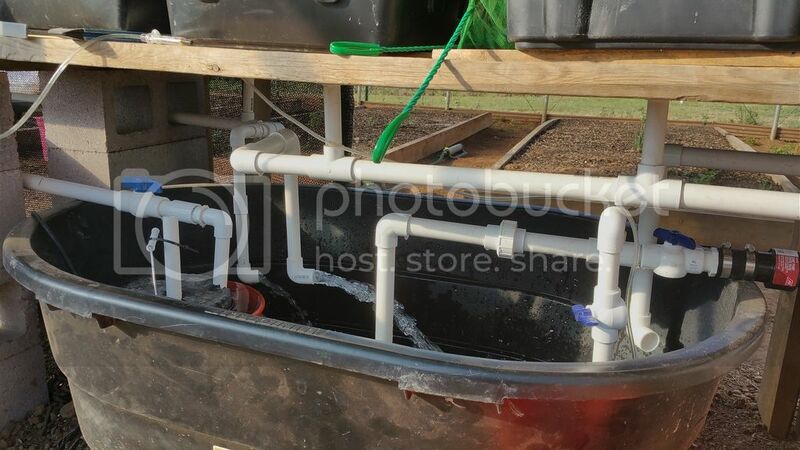 My wife wants to put the FT/filtration in the Greenhouse, and I am leaning towards a separate structure and plumb everything into the Greenhouse. THINKING of two systems, one for colder weather crops with the second coming online when the weather warms up. I just now have been trying to find information on how to calculate what requirements are needed to have the FT/filtration provide enough nutrients to the system to support, but very much in its infancy as far as any real understanding. That is enough for now, and Thanks in Advance to all who share info/insights. You may also want to consider adding some wicking beds. They might warm faster in the Spring and could be connected to the AP system as a drain to waste type bed. This has the advantage that you can fertilize or treat for pests without affecting the fish since the water won't be going back to the AP. The mass of the water in the greenhouse might keep the greenhouse above freezing and you'll see some moderation in temperature swings because of all the water. Welcome to the forum fellow New Mexico resident. I have wondered how many of us are from here. Good luck with you system and upgrades. What I have found up here by Las Vegas NM is in the last five years is the Sun can really bare down midday and afternoon. I've found some relief by not having so much clear plastic especially on the West side. If you can do it, I'd recommend removable/retractable shade cloth for Summer. Which side are the roll up doors on? 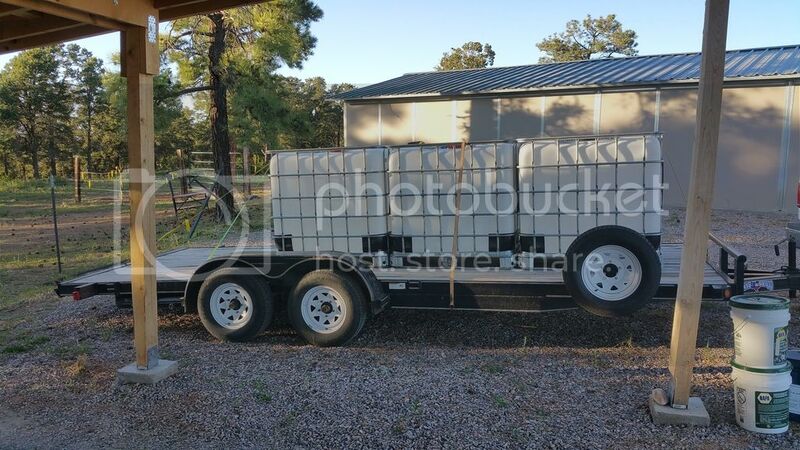 I don't know if you've seen my setup but it is a masonry 2600 gallon (10,000 liter) fish tank? I regret using 1 1/2 PVC for the SLO. For a number of reasons it should have been 3" (76.2 mm) alas it is now set in stone as the old saying goes. It is easier to reduce the pipe size than to increase it, in my stone walled setup. I have seen too many systems. Yours was one of the first that got me excited anout the possibility of year round production here in NM. It also delivered a blow as far as NM G&F with allowed fish species and a Talapia order was cancelled. (but save that topic for another time). My roll up doors are facing SW/NE and I already encountered the effects of the sun and how quickly it can change water temp this time of year. Hence the shade cloth to the rescue and is keeping the swings from a 10-11 degree (with ice baths) down to 3-5 degree. I do not think my pump (in current configuration) is capabale of keeping up with a 3" SLO unless I add an additional pump from Sump => FT. My FT is about 90 gallons, and the 1" does OK (outside of the small PVC pieces seen) but I am still babying the fishes as far as cycling is concerned and they are babies themselves. I also added a 5 gallon bucket with a liner catching the flow from the FT to act as another swirl type filter and it appears to help keep the water cleaner. Should i put the FT/filtration in a open space inside the greenhouse (with a roof overhead) or build a separate structure and plumb water into greenhouse? Or build the structure inside the GH to add additional protection from the winter weather and potentially aide in the need for secondary heat source? If separate, considerations to watch out for? My roll up doors are facing SW/NE and I already encountered the effects of the sun and how quickly it can change water temp this time of year. Hence the shade cloth to the rescue and is keeping the swings from a 10-11 degree (with ice baths) down to 3-5 degree. Good good. 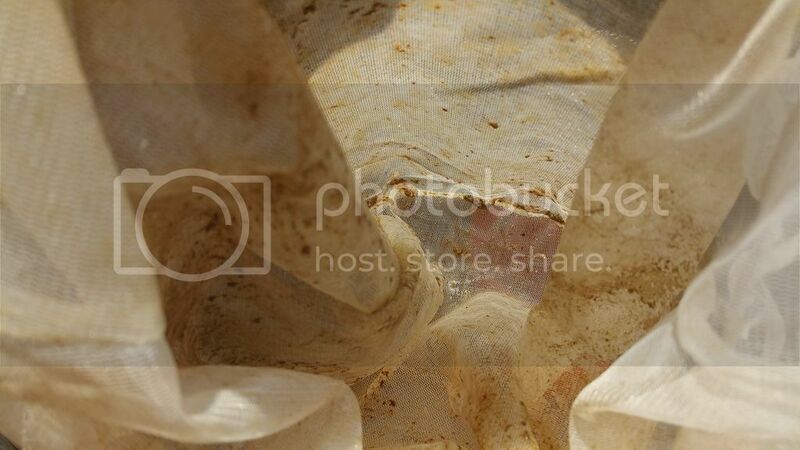 I love that reed cloth too. I believe if placed on the outside, offers some hail protection as well as shade. I've got an airlift pump which triples the flow from the SLO. Now that our trout are monster sized the SLO can't keep up with the poo removal. We're ready to harvest and buy new fingerlings from River Bend Trout Farm http://www.riverbendtrout.com/ Plus the water is now running at 66 degrees Fahrenheit, which is the upper limit for Brook trout. I would, and I did build the greenhouse as a earth-sheltered design, but I love digging. 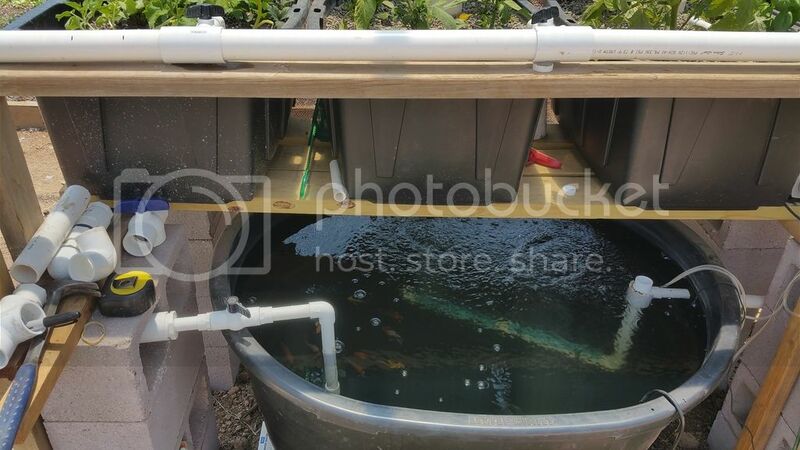 Learning about aquaponics as I went left me wondering if it would be a better plan to separate the two a fish house and a greenhouse. You might create a dug out or Kiva style pit beside the High Tunnel and put the fish tank in there. The constant temperature of the Earth helps stabilize water temperatures. 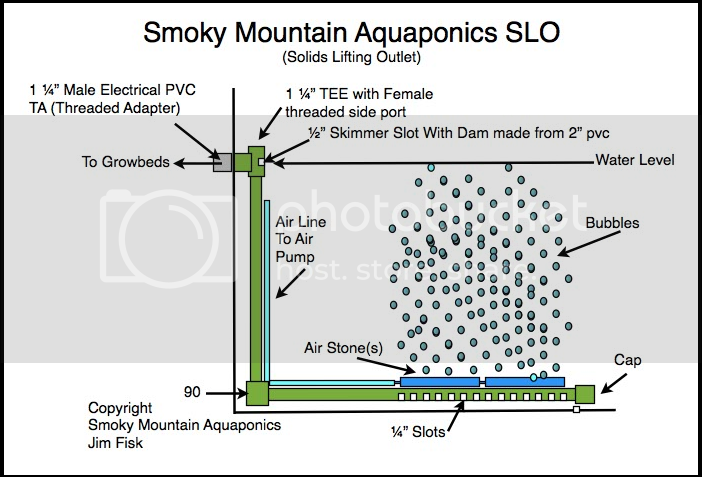 I'll have to give a single point of injection a try vs what I currently have running from a design by Smoky Mountain Aquaponics and see if I notice a change in the output with current setup and also enlarged to 1 1/2". Guess If I dig into the ground, I can set the elevation of the FT/Filtration to be inline with the height of the GB in the greenhouse and *try* to get the elevations right to where the is little/to no head pressure and able to run a smaller pump. First thing is first, finish the gravity feed to the FT and change out the SLO to 40mm. I got some plumbing fittings instead of the hard 90's based on the member system from coachchris to try and not restrict the gravity flow as much. I have one thing to mention about the SLO design. I used to have one essentially like this (but without the aeration over it) but scrapped it because the fish liked to hide beneath the pipe alone the bottom and I was finding they occasionally had injuries that looked like they were caused by the pipe rubbing against them. I now use one that goes straight up from the center and over across the top. Is this in an ibc? No, mine was in an 8ft circular stock tank so the riser is now in the center. I do use a SLO in an IBC Recirculating Aquaculture System and I've just placed a vertical SLO in the corner, it does not extend into the center or even the lowest point - it's not perfect but it works well enough - I do periodically clean near the bottom drain plug. I've directed the incoming water and the UV sterilizer output to help move solids around the tank toward the SLO in the IBC. The other thing I forgot to mention was that the pipe along the bottom makes it harder to monitor the fishes condition (since they are hiding under it). If you can get the pipe to hug the bottom well enough you might not have this problem - it's a bit easier to do this in a smaller tank. I also notice that it's easier to clean a vertical intake than it is to clean where with the slots are on the bottom of the pipe. It wasn't a big deal either way though. Should I delete the swirl filter at this stage since the system is lightly stocked and let the debris/solids/poo make their way to the GB? Should I pump the FT to the GB instead of from the sump and re-do the returns of the GB to empty into the FT (even though the water is coming from the FT via SLO)? 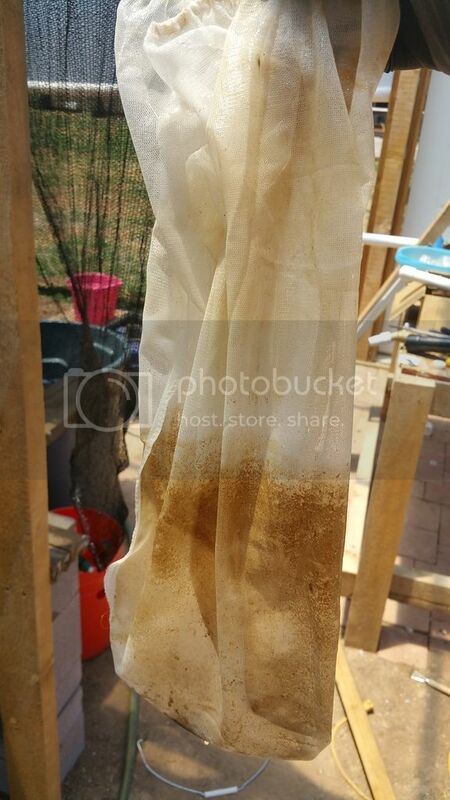 is there anyway you can plumb your swirl filter to be fed from fish tank? getting the larger solids removed asap seems to be the best from all my lurking/learning. and it is how i intent to plumb my system. also the pump will break up larger solids and then it will be harder to remove them from the system. my sump will be the lowest point in the system so everything can gravity feed to it. keep up the work and dont forget pics. hope the best for you and God bless! without using an additional pump, I cannot achieve 2nd suggestion without complete re-do based on the elevations I currently have. I am getting ready to change out the gravity fed return to 40 mm pipe and also change out the configuration of the SLO to 40mm pipe as well. HD bucket is sort of a preliminary swirl filter catching the SLO from the FT with a 5 gallon painter screen I had lying around. My GB bell siphon drains are connected with 4 (farthest PVC @ 3 o'clock and the other two GB dumping out in front of the 5 gallon bucket. Quick disconnect is the pump going to Swirl and the other 1" PVC (9 o'clock) is overflow return from swirl filter. Design being discussed with CFO and some sort of plan will soon be available for critique/suggestions to make sure that I'm going on the right path. i posted my design in my thread in new member section. i have based my design on a guy's system on youtube. username ponicswars. he had a small commercial sized system. he mainly grew vertical and i like that. i hope the best for you and your system! currently have a high tunnel that I'm going to convert over to more of a Greenhouse setup. Wall the ends up, put exhaust fans/dampers, add a second layer of film with the pump to add a 4" air gap between the film. (more than likely) build a separate FH and insulate it so not alot of the external environment has an impact and minimal heating/cooling needed. Summer temps can get as High as 90, but usually around the 80's @ 7800FT above sea level. Usually teen's/20's in the winter with negatives depending upon how the wind blows that evening. Looking @ options for either some sort of solar backup/LP generator because we do loose power quite often when the heavy, wet snow flies and can be as little as 1/2 day to 2-3 days before restored. To me, automation is worth its weight in gold for I can travel all over the state working and do not want to have to get a call that power is out and what do I need to get to string generator out/cords/etc. Don't know about what fish species, have some Koi right now, but looking @ Talapia during the spring/summer/fall and maybe trout in the fall/winter/spring -- it all depends upon what it actually takes to make it all work and what the chiefs approve for my budget. So, more reading, and I think I am fighting nutrient lock. PH has been around 8.2 since the beginning, and now the tips/edges of some of the plants are browning/curling. Finally got some PH down and have added about 400 gallons worth of treatment today (over the course of 8 hours) and finally getting the color shift to orange using the high range test kit. Going to keep at it over the next 48-72 hours and get it around 7.5 'ish. this is what 36 hours gets me from the SLO => ST. My Ammonia/Nitrites are @ 0 and still have yet to get anything to register on the Nitrates. Still some debris/poo in the bottom of the bucket that I'll start collecting for the dirt garden.